Garrett County, Maryland, is packed with fun and exciting things to do! A great way to spend your next vacation is relaxing at the hottest fishing spots in Maryland. When you stay with us at Lake Pointe Inn, you are ideally located to use every one of the best lakes and ponds in the area. With so many from which to pick, use our list of fishing spots in Maryland to help you find the perfect one for you! Broadford Lake, located in Garrett County, was built in 1972 as a water supply reservoir for the town of Oakland. In 1975, the Lake was opened for fishing. Broadford Lake Park provides not only fishing but also other activities such as swimming, biking, canoeing, and kayaking. The park has one boat ramp, and rental boats are available at the park’s concession stand. Broadford Lake supports a wide variety of fish species including largemouth bass, yellow perch, bluegill and tiger muskies. Smallmouth bass are also present and can be found near the dam breast and rocky areas of the lake. If you are an avid fly-fisher, the lake offers sunfish. The Lake also has a spring stock of about 2,000 rainbow trout that further adds to the fishing opportunities. Another fantastic place to fish is Deep Creek Lake. Located right on the Lake, our beautiful Inn is the perfect place to start your visit. Deep Creek Lake is unique in that it lies within the Ohio River Drainage west of the eastern continental divide. The 3,900 acres of water is a fishing enthusiast’s paradise. Supporting a wide variety of desirable game fish species, the Lake is best known for its bass fishery. 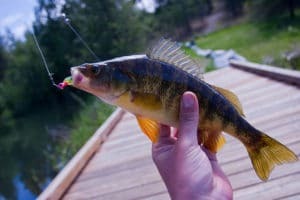 The smallmouth bass are the most common species; however, largemouth bass generally anchor the catches of winning anglers during the frequent bass fishing tournaments. If you are searching for a beautiful bass, large mouthed or small mouthed, Deep Creek Lake is the spot to prow. Walleye, yellow perch, northern pike and Chain pickerel can be found in the deep waters of the picturesque lake! The Savage River Tailwater Trophy Trout Fishing Area lies within the Savage River State Forest and provides ample public access. Experience the natural beauty of the area while kicking back and fishing on the Savage River. The river is about 55 feet in width and flows 4 miles. Native brook trout and wild brown trout are found in abundance in the Savage River Tailrace. Rainbow trout can also be found throughout the River. It is a gorgeous place to fish and to enjoy the beautiful scenery! Complete your experience of all the best fishing spots in Maryland by staying at a local bed and breakfast. Our charming rooms are all decorated in the Arts and Crafts style, which will give your trip that special touch. Your stay includes a delicious complementary breakfast each morning so you’ll be ready to take on what the day has in store for you. When looking to get the most out of your time in the area, look no further than Lake Pointe Inn. See you soon!